VATICAN CITY (CNS) — There’s perhaps no other signature vehicle in the world more well-known than the popemobile. Tall and boxy or sleek and chic, it’s the one white ride that always catches people’s eye, mostly because of the special passenger waving inside. The popemobile is a specially modified vehicle that gives the pope enough elevation and visibility that people can see him more easily as he rides through a crowd. Its top and sides can be open or partially or fully enclosed with thick bullet-proof glass, depending on the venue and what security personnel decide. 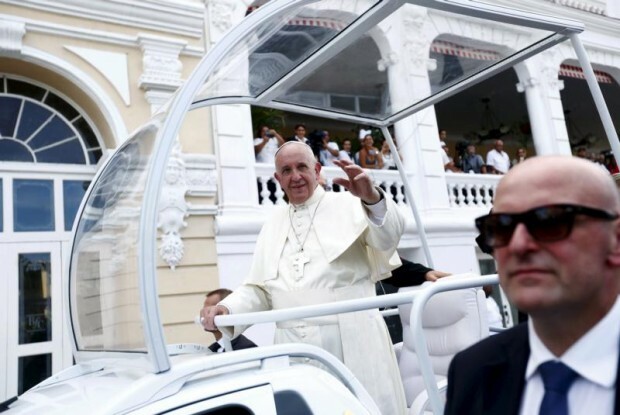 Pope Francis, who preferred subways over SUVs when he lived in Buenos Aires, has lamented the “sardine can” feel from high-security popemobiles. It was probably only natural that his church-whose-doors-are-open philosophy also apply to the popemobile. Before his general audience in St. Peter’s Square, he occasionally picks up “hitchhikers” for a spin — mostly school kids, and once a priest from his former archdiocese. The open popemobile also entices people to engage in a game of toss — hefting hats, T-shirts, rosaries, flowers, flags, notes and other goodies toward the pope, who almost always makes the catch. In his visit to the United States, Pope Francis will be using a modified Jeep Wrangler like the one he used in Ecuador in July. The Vatican ships the popemobile by special air cargo to the cities he will be visiting abroad. If the cities are many or far apart, the Vatican will ship more than one vehicle. There is also a backup vehicle in case of mechanical difficulties. The Vatican’s popemobile fleet has included vehicles from Mercedes, Toyota, Isuzu, Kia, Hyundai and Land Rover as well as Jeep. Sometimes countries offer their own adaptation for the pope’s use, like in the Philippines in January, when locals turned their typical “jeepney” bus into a popemobile. The world’s carmakers have long been donating luxury or high-end utility vehicles to the Vatican to be used by the pope since 1909 — not long after the advent of the first “modern” automobiles. Before that, popes got around the old-fashioned way. The Vatican Museums has on display an immense six-horse-drawn Gran Gala gilded carriage whose wooden wheels are more than five feet high. It was built around 1826 for Pope Leo XII. There was also the grand “sedia gestatoria,” or ceremonial papal throne that was carried through the crowd on the shoulders of 12 “sediari” or chair-carriers dressed in bright uniforms. The portable red velvet chair was mothballed in 1978 after the start of Pope John Paul I’s pontificate. While popes were often given fancy sedans, the first official white open-air “popemobile” made its debut in 1976. It was a white off-road Toyota Land Cruiser, which was used periodically by Pope Paul VI. That was followed by the 1980 Fiat Campagnola, a 1983 Land Rover Santana and a 1990 Mercedes-Benz 230. Currently, the popemobile fleet includes a brand new Hyundai Santa Fe and a number of Mercedes-Benz SUV or off-road vehicles, painted in a color Mercedes describes as “Vatican mystic white.” Once the company delivered a vehicle with a “mother of pearl” tint, which the Vatican decided was too gray, and repainted it. Vatican security prefers the vehicle be bulletproof, which makes it heavier, and have fast acceleration in the event of an emergency — two reasons why no fully electric-powered popemobile has joined the fleet yet. While most popemobiles come with rear seatbelts, the pope hardly uses them — a practice that caused great for one German citizen, who filed a complaint against Pope Benedict XVI for not buckling up during his visit to Germany in 2011. The complaint said the German pope had failed to use the seat belt as required by German law and that, as a repeat offender for his numerous popemobile drives in four cities, he should have been fined the maximum of 2,500 euros. According to German reports, the lawyer who filed the complaint said his client was primarily concerned about the pope’s safety. Seat belt laws in the United States vary according to state, and Washington, D.C., where Pope Francis will visit Sept. 22-24, requires all passengers wear appropriate safety restraints. While a slow-moving, parade-like popemobile is probably an exception, it’s not hard to imagine if the pope were to get pulled over, he’d probably invite the traffic officer on for a ride.